Candy is sweet by its very nature. It’s made with chocolate, sugar, and a variety of other pleasant-tasting ingredients. You’re familiar with this and have come to expect it from all your candy. 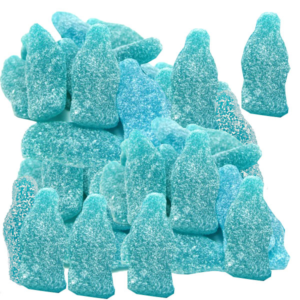 But you also know that there’s a major niche in the candy world that’s dedicated to producing the sourest of sour candy. Sour Patch Kids and Trolli sour gummy candy are just a few of the many sour gummies that kids and adults love to consume. If you really think about this, you might come up with a question: why do people intentionally eat candy that is so sour that it makes them scrunch up their faces with the intense flavor sensation? For one thing, eating sour candy of that magnitude is fun, plain and simple. It’s entertaining to watch your friends eat sour gummy candy and then make faces as they chew. You can even challenge your friends to see who can eat the most sour candies without making faces. Another reason to eat sour candy is to see if you can make it through the harsh flavoring so you can then enjoy the sweet candy underneath. You have to overcome an obstacle first, and then you earn your reward. This isn’t something most candies offer. You have numerous options when shopping for sour gummy candy this Halloween. Trolli Sour Worms, Sour Patch Kids, sour fruit slices, and many more sour candies are available for you to hand out to trick-or-treaters. Browse these and more on BlairCandy.com.